Reg Pridmore is a former AMA Superbike racing champion, and is now known worldwide for his popular CLASS Motorcycle Schools. Reg has finally taken a time out to write a book about his motorcycle riding philosophies, and it’s a winner. “Smooth Riding the Pridmore Way” has become one of my all-time favorite books about motorcycle riding skills. It’s absolutely packed with useful tips that are presented in a factual and very readable style with an additional bonus: lots of Reg’s adventures and lessons learned from the track and a lifetime of motorcycling are woven in to keep things interesting and relevant. The book’s introduction threw me a bit — it’s mostly focused on Reg’s background, and although interesting, it made me wonder about where the book was headed. But Reg wastes no time getting to the core of the matter — Chapter 1 sets the pace for the rest of the book by using one of the best methods known for quickly and efficiently transmitting information: introduce the material, teach it, explain what you just taught. In each chapter, Reg briefly explains what you’re going to learn, why you should know it and what it will do for you on both the track and the street. Then he lays it all out with precise instructions on what to do and how to do it. Each paragraph is loaded with tips; there’s so much here that I’ve gone back through it several times to take notes and learn some more. This is definitely a book that will get dog-eared over time; it’s too bad that it can’t be taped to a tank bag to use as a reference whilst riding! Each chapter includes a sidebar where Reg adds information about past races, racers and other stories that are directly related to the chapter’s lesson. This methodology really adds to the format. Just pouring out information in rapid fire fashion could quickly get old, but by interspersing history and lessons from the track, Reg adds a richness and texture that help deepen the understanding and improve the retention of the information that’s presented. Reg does a great job of explaining why and how racing strategies are useful for the street, and he does it better than any other motorcycle riding skills improvement book that I’ve read. The book includes lots of nice photos and some graphics to help illustrate the points, but the “meat” of the book is in the text. Reg Pridmore is known as “Mr. Smooth”, and the book is all about translating “smooth” to the street and track. It’s really a concentrated dose that sums up Reg’s philosophy and years of study and practice, and I honestly think that paying the 25 bucks or so to have what amounts to private lessons from one of the best riding skills teachers alive is an absolute steal. Although there’s some difference of opinion in the world of motorcycling regarding counter-steering vs. body steering, suffice it to say that Reg explains his thinking and my feeling is that the term “body steering” is a misnomer; both methods can and do co-exist and learning how to use and coordinate both makes for a better rider on both street and track. The chapter on Equipment isn’t as satisfying as the rest, but there’s lots of information in this book. It’s really a shame that most motorcycle riders spend very little or no time ever thinking about the art of riding.Reg emphasizes throughout the book the importance of continuous improvement and the fact that there’s always more to learn. 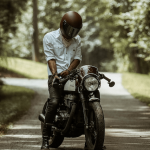 The recent dramatic increases in motorcycle deaths in the U.S.A. should be more than enough motivation for riders to understand that it’s very important to think about riding and never stop learning.